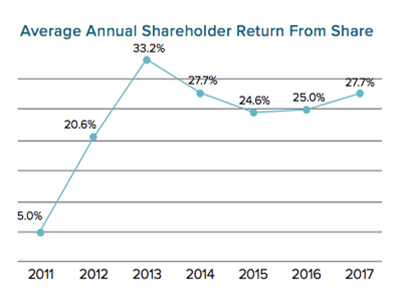 Each year, Edgewood Real Estate Investment Trust (REIT) looks forward to providing its shareholders and partners with excellent growth in earnings per share, stock price and annual dividends. 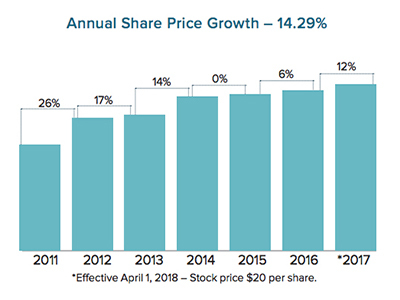 To this end, we do everything we can to make shareholders aware of our financial performance today, along with historic trends and expectations for the future. Here you can get a quick summary of Edgewood REIT financial performance. A Dividend Reinvestment Plan is offered as a convenience to investors of record who wish to increase their holdings in the company. Additional shares may be purchased, without a service or sales charge, through automatic reinvestment of quarterly cash dividends at a 5% discount. Calculations for the Investment Performance Chart are based on an initial investment of $100,000 with all quarterly dividends reinvested. An investment of $100,000 on January 1, 2011, (inception) would be worth $301,000 as of December 31, 2017.